SICK has launched the OD5000 displacement sensor to provide high-performance measurement at frequencies of up to 80kHz even with fast-moving and rotating objects, and in high-speed production. The sensor also has an outstanding capability for thickness measurement of surface coatings and transparent materials. Meeting customer demands for improved production monitoring and quality assessment at high speeds, the SICK OD5000 is a laser sensor that ensures precision measurement and accurate product positioning for difficult-to-detect moving objects or surfaces finishes. “The SICK OD5000 is the high-precision laser sensor of the SICK OD displacement sensor family,” explains Neil Sandhu, SICK ‘s UK Product Manager for Measurement Systems, “yet it offers excellent value for its performance. The OD5000 is part of SICK’s well-established OD range of laser sensors, developed for high consistency and linearity in measurement results even at high production speeds. Thanks to the intelligent measurement filters incorporated in the OD5000’s firmware, virtually any object can be reliably measured, ensuring stable measurements with the highest level of repeatability on a wide range of surfaces. 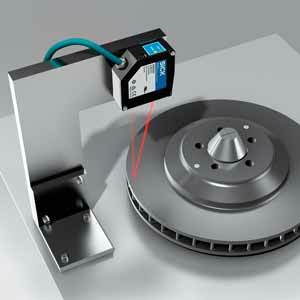 The rapid 80kHz maximum measurement frequency of the SICK OD5000 has been developed to meet customer expectations for analysis of height data on high speed production lines, especially during full-speed rotation of objects such as cooling fans for electronic goods, and vibrating objects such as brake discs under test to micro-millimetre levels of accuracy. Using the innovative ATMOS (Auto Tuning cMOS) receiving chip for faster detection of substrate contrast changes (black/white shift, or matt/reflective), the OD5000 can automatically sense a wide range of substrate surface changes. This capability delivers high-accuracy measurement of single and multi-level thicknesses as well as detection of gaps, holes and thickness variations across flat materials. The SICK OD5000 delivers precision measurement of challenging surfaces whether transparent, reflective or matt, white, coloured or black including glass, painted or coated finishes. This makes it ideal for a range of challenging measurement applications in component manufacture in industries such as automotive and electronics. Additional versatility is facilitated by the compatibility with an additional sensor head connected through an AOD1 evaluation unit allowing configuration and control of multiple displacement measurement sensors for easy thickness measurement using two sensor heads. Configuration and measurement evaluation of the OD5000 is easy using SICK’s SOPASAir web server graphical user interface. As an Ethernet connection interface is integrated directly into the sensor head, no additional controller is required reducing cost, and speed of data communication for real-time monitoring is enhanced. The SICK OD5000 displacement measurement sensor offers a choice of two operating ranges, either 65mm – 105mm, or 110mm – 190mm, thus meeting a range of production requirements. Two diameters of laser light spot widths, 120µm and 5µm, enable the sensor to be matched to the application.